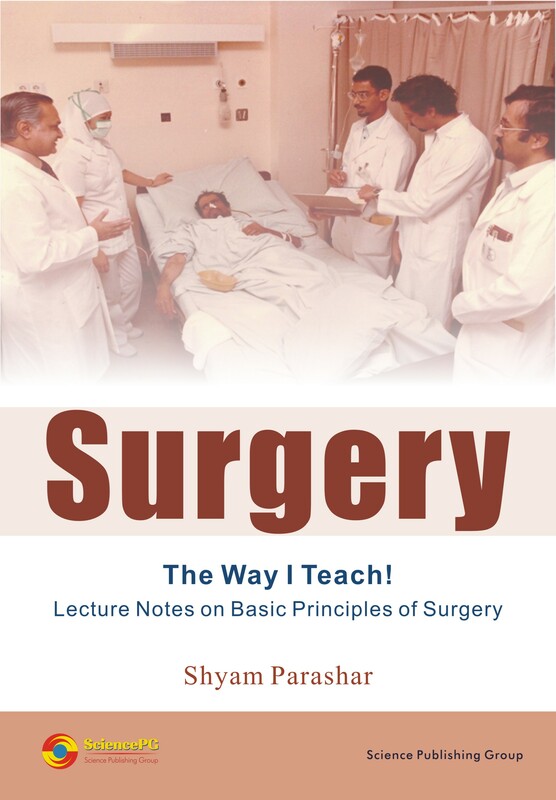 Prof. Shyam Parashar is a 1959 medical graduate from G.R. Medical College, Gwalior and Vikram University in India. In 1962 he obtained the degree of Master of Surgery [M.S.] from the same University. For next seven years he continued his further training at All India Institute of Medical Sciences in New Delhi, India, and in various hospitals of England. He obtained the Fellowship of Royal College of Surgeons of Edinburgh [FRCS Ed.] in 1966, and returned to India to join Goa Medical College in 1969. In ten years he reached the highest rank of full Professor and Head of the Department of Surgery at the same college. From1981, he worked as Professor of Surgery at King Faisal University [later named as University of Dammam], and senior Consultant Surgeon at King Fahd Teaching Hospital. For twenty five years he also held the position of 'Director for Postgraduate Training Program in Surgery'. He left Saudi Arabia in 2013, but continues to hold the position of 'Emeritus Professor'. Prof. Parashar has been a very popular teacher and well known surgeon amongst his students, trainees, colleagues and community in Goa as well as in Saudi Arabia. His students have been occupying very senior positions in India and abroad. He lives with his wife in USA; however he spends a lot of his leisurely time at his beautiful resort home at Dona Paula in Goa, India. This work is my attempt to simplify and teach basic sciences and their application in clinical decision making. Students of surgery must know that communication skills, mannerism and ethics play a very significant role in the learning phase of their life. Any student in a white coat with a stethoscope around the neck and hammer and tuning fork peeking out of the coat pocket cannot disguise the fact that they are still students and that they have to win the trust of their patients before they can obtain the required information related to their history and physical examination. Students must introduce themselves to their patients, take their permission, maintain privacy, and respect confidentiality of the information provided. They must keep the conversation simple, focused, specific and relevant to the patients' problems, and use uncomplicated understandable terms. Students should not independently discuss the diagnosis, prognosis and management with the patient or any member of their family. Any curiosity and questions in this respect should be directed to the treating surgeon. There is no substitute for modest appearance and courteous behavior. Be gentle to your patients who must already be suffering. That is often why they seek medical help. While examining them do not do anything that may increase their pain or suffering. Remember the dictum: "If you cannot do any good, please do not do any harm". Surgical examination includes examination of private parts and internal examinations. Seek permission before proceeding. A cooperative patient can help solve many of students' problems. Most surgical patients have wounds that require dressings. Do not expose wounds repeatedly. Follow instructions from the teacher or the nurse. Pay attention to hygiene and patients' comforts. Wash your hands, use gloves where necessary. Do not expose or move your patient unnecessarily. Prepare a scheme for examination before you expose the patient. Thus you can complete the examination and accomplish the objectives within the shortest time and with minimal discomfort for the patient. This book focuses on applied anatomy, Patho-physiology and principles of management of these ten groups, based on my experience and understanding.